Do you have the right computer configuration for digital photography? If you're wondering if you have the right computer configuration for digital photography, look no further. Figuring out what kind of computer you need to work with digital photography can be confusing. Below you will find information on the types of programs you might want to use as well as the technical capabilities your computer will need to run them. Does your camera require special software to download its photos? Does your computer meet the minimum requirements for the software? Do you have the proper cable to plug your camera into your computer? Most cameras these days require a cable that has standard USB on one end and Mini USB on the other, but it may differ from model to model. 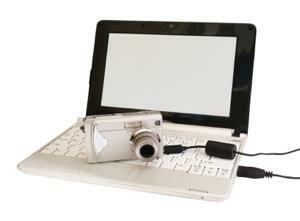 Note: USB is backwards compatible, so you should be able to plug a USB camera into a USB2 port (and vice-versa). Is your camera built to play nice with your operating system? While almost all cameras will work with almost all computer platforms, occasionally you'll run into compatibility problems that will require some patience and tech-savvy to rectify. When shopping for a camera, check ahead of time to make sure the model you want will work with your OS. MacWorld has posted a tutorial on how to import your photos using iPhoto in Mac OS X. This short tutorial will show you two different ways to import photos, including how to use ImageCapture to pull photos off your camera in Mac OS X. Here is a tutorial from Microsoft that shows you how to pull the photos off your camera on a Windows computer. If you are unable to plug your camera directly into your computer, you may still be able to purchase a separate card reader that can read the memory card without it being in the camera. A card reader is a small device that plugs into the USB port of your computer, which you then slide your memory card into. You then access it like an additional drive. Are You a Basic User? If you have basic computer skills, there are a few great applications you can use to edit your photos. Memory: 512MB is required, but 1GB is recommended. You will need more if you plan on editing large files - consider 2GB or more. Disk space: you will need minimum 4GB available on your hard drive, but in order to store your photos, you might want to have at least a 100GB drive. Memory: 256MB of ram is the minimum requirement, but you will want to have at least 1GB if you are editing huge photos. Disk space: 150MB of space for the application itself, and then another good chunk of space for your photos. Consider getting at least a 100GB hard drive if you love to take pictures. Photoshop Elements is a great photo editor for intermediate users. This is a good segue between basic apps like iPhoto and the more advanced editors such as Photoshop. If your computer skills are advanced, you may want a more serious photo editor. Here's what you'll need to run with the big boys. Photoshop CS4 is the biggest, baddest photo editor out there. If you master Photoshop, you'll be able to find a job as a graphic designer. Here's what you'll need to make this powerhouse run on your computer. Memory: 1GB bare minimum. It is highly recommended that you get at least 2GB if you plan on editing even remotely large files. Disk space: 2GB of free space, and then plenty of space for editing files. Definitely consider getting a 200GB drive or larger if you're serious about using Photoshop to its fullest potential. Disk space: 2GB of free space, and then lots of room for Photoshop files. You should really consider getting a 200GB drive or larger if you're serious about using this program.